The Virtual Learning Community (VLC) is a collaborative effort of all of North Carolina’s Community Colleges to increase the quality and availability of online learning and support services. The Developmental Math Redesign Program is designed to be used with students striving to meet college entrance requirements. 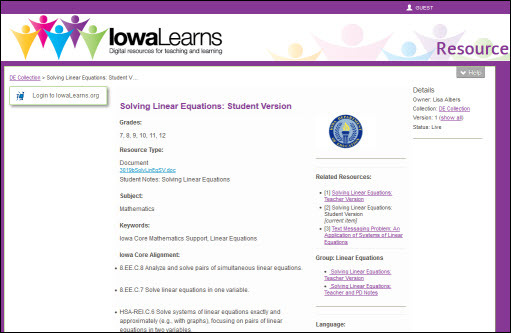 NCLOR has resently imported the resources used in the VLC developmental math courses. Theses developmental math resources have also been tagged to the appropriate DMA 010-080 student learning outcomes. The resources from this series may be used in the following courses: DMA-010, DMA-020, DMA-030, DMA-040, DMA-050, DMA-060, DMA-070, and DMA080. To search for these resources, go to Browse by NCCCS Combined Course Library > Course Subjects C – D >and then click on DMA -Developmental Mathematics. You can also search by student learning outcome by going to Search> Click on “Within”> choose Student Learning Outcomes from the advanced search.